“We’re closing on the Doranian vessel.” Haldo Compz narrowed his eyes as the distant image of the squat little craft appeared on the viewer. 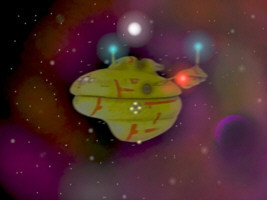 A bulbous yellow ship with odd markings and strangely curvy lines along the middle to control the warp field. Two small nacelles poked proudly from her sides and an awkward impulse engine that was way too large was bolted uneasily to the top. “Velocity?” Captain Girling rubbed his chin thoughtfully as he watched the craft before him. “Time to intercept?” Blake asked, his attention fixed on the image while his mind mulled what lie ahead for them. “You want to work on this report?” She sighed wearily. “Complicated isn’t the word.” Haldo chimed in. “It worked for Kirk!” Doctor Jones smiled. “You can count on me.” Haldo called out ironically after him as he began his analysis of the systems. The ready-room door slid shut behind them with a sigh. Blake gestured in silence to the chair opposite his over his desk and fell heavily into his own. They remained in silence for a few seconds while they both contemplated the somewhat daunting task before them. “How do we do this?” Katherine said finally with a shrug. “When we do finally give this report to Starfleet how do you think they’ll react?” She rubbed her forehead as she spoke. “That was in our last report.” He reminded her with a shake of his head. “The distress signal?” She raised an eyebrow. The Corinthian was travelling at a relatively leisurely pace of barely Warp 7 towards the outer border of the Alpha quadrant under cloak. “According to my calculations we could have made this journey in about 6.4 seconds if we’d engaged the Transwarp drive.” Haldo pointed out as he lounged at his terminal with his hands knotted lazily behind his back. “If he can find them!” Doctor Jones added with a snigger of amusement. “With many more to come, I imagine.” Katherine grinned. “It just seems a waste of time to rely on simple Warp drive when we could have got to the co-ordinates a lot faster and began probing ahead with our long range scanners.” Haldo sighed, deeply frustrated at having nothing important to do. “I’m feeling much better now!” Blake scowled at him. “Aren’t we Starfleet renegades?” Haldo asked in a way intended solely to cause annoyance. “If he’s alive.” Doctor Jones said darkly, his brow furrowed thoughtfully. “Captain!” Ensign Rogers said suddenly. “I see it.” Girling sat up as the Corinthian computer fed the information into his brain. He could see the message played out directly through his thoughts as if it had originated in his own mind. “What is it?” He asked curiously. The other sat forwards intently, listening in interest. “You’re certain?” Blake stood up and turned to his engineer. “I have the vessel on sensors.” Clogg offered as he set the controls to send the image to the main viewer and waited for instructions to do so. The image suddenly appeared large before them in accordance with the captain’s thoughts. “Why do you ask?” Blake frowned. “Not us, I’m afraid.” Blake sighed as the ship automatically changed course. “We’re answering the distress call?” Haldo leant forward across his console and adopted a disapproving scowl. “Might I suggest that under the circumstances we raise our shields and project a full tactical detection grid in case of other cloaked vessels in the area?” Clogg set in the parameters of his plan to the main computer to be activated at the Captains discretion. “The ship heading away is a Federation design.” Doctor Jones raised a quizzical eyebrow. “This is still Federation space!” Haldo reminded him. “I remember it well.” Katherine sighed and dropped the Padd listlessly to the ready-room desk. “I’m not sure we should even mention the other vessel…” Blake scratched his head to remove an imaginary itch. “I guess so.” He agreed. although still harbouring significant doubts abut the entire incident. He slid his fingers cautiously over the cold metal plate as he edged forward along the narrow tunnel. The lighting was sparse and the air was thin and sour. The temperature was so low that the cold was almost tangible, like a thing with a solid form you could touch or feel. His lungs burnt as he inhaled the foul, frosty environment and burnt twice as hard as he breathed it out sending a curl of white vapour from his aching lips. “Are you alright back there?” He whispered. His jaw was tired from the shivering that had already permeated his entire body as made his way along the path. “I’m ok, Captain.” Ensign Collins replied, her voice shrill and weak as she spoke. “Me too.” Crewman Gradlow gasped. He had never meant to be on the ship's bridge, he was assigned to engineering. It was just his luck that he had been sent to the command deck at exactly the wrong moment that had set off the chain of events that led him to find himself where now he did. “How much further?” The young Ensign asked, her voice weak from the exertion. Captain Reader wanted so much to tell them both some good news but the light ahead was still just a dot and even though his eyes had adjusted to the poor light he couldn’t make out the service hatch in the far distance. “It can’t be much further.” He settled for a response that at least held no deceit. He had never felt closer to his crew than now during their lengthy incarceration aboard the alien vessel and wanted to be as straight forward and honest as possible. “Our guest is faltering.” The Crewman ventured at the humanoid following them as well as he could. 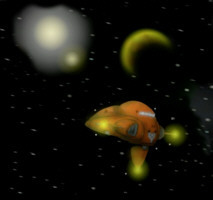 “You’re doing splendidly.” Captain Reader called back to the alien they had met on their investigation of the vessel. Some time before they had discovered that the magnetic door seals ceased to function properly for ten seconds every four hours when the power systems were switched over. That had given them a four hour long window ever day to explore the ship before they could return to their cell undetected. Their third foray was their boldest and would hopefully prove the most significant. “Tell me more about Earth!” Varpo gasped, his muscles aflame with the incredible effort of keeping up the pace and charged with the determination of a man fighting for his very life. “And now?” Captain Reader called back knowingly. “Now, Sir it seems like the most beautiful place in the entire Galaxy and I would give up my limbs to be back there.” He smiled weakly. “What about your home?” Ensign Collins asked the green little man whose skin was scaly and dry and whose black eyes luminesced eerily in the dim metal tunnel. “You know much about them?” She persisted wearily. The young Ensign flinched visibly at the notion. “I’m afraid I have to agree with you on that one.” Androv scowled to himself. “How’s it going?” Haldo craned over Doctor Jones terminal while the scientist worked. “Don’t you have work to do?” Jones grumbled back. “Do you have to bother me?” Jones snapped at him before suddenly realising his mistake and regretting his words. “I’m just busy trying to decode this signal!” The little scientist ran his hand over his head thoughtfully. “Tricky is it?” Haldo goaded. “If you need my help…” Haldo nodded arrogantly to himself, relishing ever moment of annoyance he was causing. “Drink?” Blake suggested, standing up as a cup of coffee instantly appeared in the replicator alcove. “Any old distraction…” She goaded with a knowing smirk. “Tea please. Herbal number 1701.” Her beverage materialised as soon as she’d finished speaking next to his. Blake took the two identical mugs and placed them on the middle of the desk before perching himself on the edge with a heavy sigh. Katherine picked up the Padd with an almost apologetic expression. “Where were we?” She began. “Have you got a registration on the Federation vessel?” Blake peered at the viewer although both ships were still beyond visual range. “Hail them.” Captain Girling instructed thoughtfully. “How long until we rendezvous with the ship emitting the distress signal?” Blake frowned deeply, more interested in the vanishing ship but grimly aware of their priorities. “Three hours at Warp 8.” Clogg told him with consummate efficiency. “I’m not detecting any other vessels close enough to detect the signal!” Katherine added. His taste-buds lit up with the bitter tang as the hot, black, sugarless coffee paraded over his tongue. “And then we found the ship!” He said with a sigh. “How’s your herbal tea?” He smiled thinly back to her. There was a low grating sound as if the two pieces of metal had sealed together over the many years and were finally being pulled apart by slightly inadequate machinery. Then, with a sigh the hatchway wrenched itself open spilling in the light from the rows of lamps outside in the shaft and the acrid, stale air flooded in. “How far is this climb?” Captain Reader groaned at the prospect of the seemingly infinite shaft before them that clawed up into the upper reaches of the alien ship. “Time?” Crewman Gradlow asked with a sigh as he rested momentarily. “We still have a long way to go.” Varpo gasped, his breath weak and coming only with considerable effort. “Are you alright?” The Captain turned to face him with a worried expression. “Do you really think they’d kill us all?” Androv scowled. “If they saw us as a threat then yes, I believe they would.” Varpo agreed grimly. “That leaves almost two hundred members of the crew unaccounted for, allowing for those killed in the destruction of the Olympus.” Ensign Collins shut her eyes as she recalled the friends she’d lost in the attack, some close enough that she had considered them her true family. “I lost my home-world to them!” Varpo’s breathing was becoming less laboured as his strength began to ebb back into his muscles. Doctor Jones sat back with a wide grin on his face. “Is your underwear too tight?” Haldo goaded with a wide grin. “There’s no message?” Haldo smirked at the ridiculousness of the suggestion. “One that’s so low only about a dozen ships in this quadrant would be capable of detecting it.” Haldo agreed. “Well that in itself suggests that there’s a good chance that the message was aimed at us.” He explained. “We know one thing!” Clogg interjected. “And what’s that?” Haldo sneered at the security officer that he viewed as largely a trained animal, like a guard-dog tugging at a leash with a claw hovering pensively over a weapons discharge control panel. “Whoever sent it knew what we’re capable of and that we would be watching.” He told the grumpy engineer. Katherine pressed a couple of keys on the Padd to open the next section of their report. “So we found the ship?” She began thoughtfully. “And there was still no sign of the vessel that had fled from the sight.” She asked, confirming her memory. The Corinthian’s cloaking device was extended to mask her arrival through the Transwarp channel. “Full scan.” Blake instructed as he peered at the viewer while they approached the vessel at full impulse. “A graviton shear weapon?” Ensign Rogers shrugged. “Possible but unlikely.” Haldo frowned. “We’re in transporter range now!” Clogg announced as the crippled vessel loomed large in the viewer. A sleek and slender grey hull with twin nacelles mounted on the tail and four atmospheric control veins jutting out evenly. 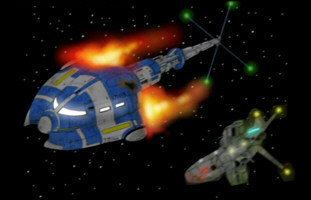 One of the nacelles had been smashed open and was sparking with flames from the shattered power conduits and the hull had tears along the outer skin. “Sir?” Clogg stepped forward hopefully. “Yes sir.” Clogg agreed, clearly disappointed at the decision. Suddenly both the Captain and Medical officer vanished in a flickering blue transporter beam. The Allek vessel was a small commercial design. It had limited capacity for cargo and large accommodation for the crew. The bridge was at the top of the slender hull and was a spacious and well appointed for such a small vessel. They looked around quickly as Katherine snapped open her Tricorder and began a detection sweep. “Over here.” She called out, moving instantly to the fallen body of a humanoid male. She ran her equipment over him while the screen danced with lights and displays. “Is he alive?” Blake frowned. The lighting aboard the vessel was low and grim, the emergency lights bathed the room in a sickly yellow glow and long, dark shadows clawed from the consoles along the opulently carpeted floor. “Cause?” He shrugged as he glanced around the eerily silent vessel. Blake’s eyes narrowed defensively as he caught sight of something that attracted his attention. “Katherine!” He said softly, drawing a phaser reflexively as he began stalking to the rear of the bridge. She spun around and saw a dishevelled looking pair of feet poking out shyly from behind the instrument panel. She gasped and pointed her medical Tricorder probe at the fallen man. There were no readings that suggested life. “Is he stable?” Blake pointed to the first man they’d found as he returned his weapon to his belt. “But he’s breathing?” Blake asked. “Now there’s a cheery thought.” Blake sighed wearily. “The Corinthian is faster.” Jones reminded him. “Do you think she can detect us?” Jones turned to the security chief. “Their weapons are no match for ours?” Jones asked with a curiously raised eyebrow. “From what we’ve seen of their weapons they are pretty close to our phaser channel output.” Clogg smirked. “What?” Jones cried out angrily, his pride severely dented. “Although they have only a fraction of the power of our cannon.” Clogg added with a grin. A ship that had only 10 decks in total would be classified as rather small these days among the federation. Climbing up that far on a stark metal ladder when each metal rung was so cold it seemed to burn your unprotected flesh and the weariness from crawling through tunnels was still pervading though your aching muscles was quite another thing. “How big would you guess this ship is?” Androv called out nervously, stopping to glance down the shaft which vanished into darkness many hundreds of metres beneath him. “You don’t think they built this?” Captain Reader called out, keen to keep them all talking, the better to ignore their exhaustion. “So where did they come from?” Reader raised an eyebrow. “What did you hear?” The Ensign regretted asking as soon as she had. “You prefer a more scientific approach?” Varpo asked sarcastically. “We do.” The Captain agreed. “They didn’t destroy the Corinthian!” Captain Reader told him. “What is that?” Varpo asked with a huff as he hoisted himself along the ladder by an effort of pure will. They continued in silence towards the upper hatch. “Are you hungry?” Blake asked, still perched on the edge of the desk. Katherine glared at him in annoyance over her report and said nothing as he ordered the food from the replicator with his mind. “I just like to eat healthily!” She told him flatly. “You’ve got nobody to impress here.” He smiled as he passed her the plate to be met with a stern expression of hostility. “I mean you don’t need to try…” He said hopefully. Her fixed expression continued unabated. “Shall we just carry on?” She suggested dryly. “Any sign of the other vessel?” Blake asked as he materialised on the bridge of the Corinthian. “What do you mean “we” did?” Haldo grumbled at him. “Engage on the course.” Blake cut him off before he would begin to really get annoying. Katherine sat beside the unconscious man in the sickbay. He was young, barely thirty years old and slightly built. He had a mop of unruly light coloured hair and his blue eyes stared out glassily and unseeing from his face. She glanced over at the dead Human. He was older, maybe fifty years and had the look of a distinguished and intelligent man, even in death. She held up the Tricorder and scanned for every possible thing she could imagine but still was at a loss to explain what had caused their condition. “Girling to Rogers.” Her Comm-badge chirped at her. “Rogers here.” She touched the badge and huffed her annoyance at the stubbornness of the mystery. “Any news?” He asked over the channel. “No records of any kind?” Blake persisted. “You certainly have my attention!” Haldo turned and folded his arms over his chest. “Thank you, Captain Compz!” Blake scowled sarcastically. “So why did they stop?” Blake shrugged. “Find the Federation ship and ask them!” Haldo suggested as the stars streaked towards them on the viewer. “We’re approaching the point where the vessel disappeared.” Clogg told them. “There’s nothing there.” Haldo frowned. “There’s nothing.” Haldo rested his chin thoughtfully on his upturned palm. “So we continue?” Doctor Jones asked nervously. “Explain?” Captain Girling turned to his cryptic engineer. “There’s no background radiation of any kind coming from the area I’m scanning.” He said with a puzzled expression. “There’s be something!” Haldo grunted. “What do you suggest?” Blake asked with a shrug. “Type 4 probe loaded.” He said as the probe automatically blew from the launch tube. They watched as the remote information appeared in the centre of the viewer. “It’s gone!” Haldo cried out, jumping up from his seat. “It’s disappeared off my sensors too.” Clogg agreed. “Course laid in!” Clogg told the Captain hesitantly. 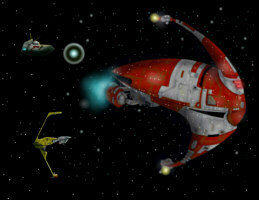 The Corinthian edged forward gingerly towards the point in space where the little Federation vessel had disappeared. “Let’s go!” Blake breathed heavily. The viewer flashed brilliantly for a fraction of a second. “Oh my god!” Haldo gasped. “It’s been complicated from the moment I woke up in a glass tube after being dead for ten years.” He said wearily. “And getting more so every day we’re out here.” She reminded him as she took a bite of her tasteless sandwich. The metal door slammed to the ground heavily sending a trail of dust blowing up from the floor and a metallic echo bouncing off the exposed walls far into the distance. “We made it.” Captain Reader smiled broadly, using the last of his strength to pull himself from the service duct before the others. He clambered out, peering into the dim hall with narrow crawl-ways and corridors leading off in every direction. He wished he had a phaser but would have happily settled for a metal bar in his hand with which to fend off the frightening aliens. Ensign Collins gasped as she rolled from the hatchway, her chest heaving for air. “The worst is over, right?” She spat the words out haltingly. “Depends if we get seen doing this!” He told her with a raised eyebrow and a reassuring smile that fell short of his intentions. Varpo climbed out next and crawled away from the hatch wearily, his body aching, his muscled on fire. “What now?” He managed to ask through halting breaths. “Ran?” Androv cried out in disbelief. “I’ll need them!” He sighed, collapsing on the floor. “We all will.” The Captain assured him. “Glad to hear it.” Varpo smirked. “No sir.” Ensign Collins shook her head. “The Dark Angels blood!” Varpo corrected. “The noise should cover our dash across!” The young Ensign added hopefully. “Is there machinery down there?” Androv shrugged. “No.” Varpo shook his head solemnly. “Then what?” He shook his head curiously. Captain Blake Girling stepped onto the bridge of his ship. “Report?” He asked. “I thought she might be.” He smiled back. “And this signal we detected?” Blake turned to the Doctor. “Any idea who it came from?” Blake asked hopefully. “Them?” Girling gestured to the Doranian ship in the viewer ahead of them. Blake stepped back into his ready room to where Katherine was waiting for him. “Shall we carry on?” He sighed, virtually falling into his chair behind the deck. “Ok.” She nodded with a smile. “What the hell is going on?” Blake shook his head in puzzlement and turned to his staff for opinions. “I’m working on that!” Haldo told him as his fingers danced over his controls. “At least we’re alive.” Jones breathed a sigh of relief. “Have we walked into some kind of war?” Haldo shrugged. “The first question I want answered is why we couldn’t see it.” Blake aimed the question at his engineer. “Are you suggesting that somebody has cloaked an entire region of Federation space to have a private war in?” Blake shook his head. “Any sign of that ship?” Blake turned to Haldo again. “It couldn’t have crossed that kind of distance in this time, not even at that Warp factor.” Jones frowned at the readings that while illogical appeared to be correct. “How long at warp 8?” Blake frowned at his engineer. “Let’s go to Transwarp!” Blake acceded. The small commercial Federation type vessel was an ageing design. It had a central pod that contained the cockpit and the engineering system and two large cargo pods jutting from either side. 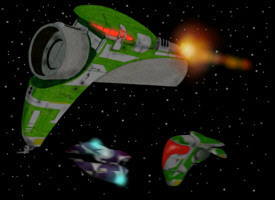 At the rear were two small nacelles and massive atmospheric stabiliser wings that doubled as a subspace antenna array. The vessel loomed in the Corinthian's viewer as the ship emerged from her Transwarp travel. “Transwarp drive is stable.” Haldo reported as the nacelles swung back into their normal position. “Hopefully we won’t need to.” Blake noted as he watched the small ship. “Well this one looks like it was assembled by the same monkeys who left to go home half way through.” Clogg grinned in accordance with his assessment. “Scan the ship!” Blake ordered, his attention fixed by the mysterious vessel. “We’re being hailed!” Clogg looked up, startled by the new information. “On screen!” Blake turned to the viewer grudgingly. “Goruss Clogg to Captain Girling.” The intercom chirped. “Girling!” He acknowledged, pressing his badge. “We’ve detected something on long range sensors.” Clogg began. “On my way!” He replied, hoisting himself eagerly from the chair. “All in a day's work!” He grimaced as he left to enter the bridge. “So they are on a final run for home.” Haldo nodded to himself. “Any tactical data?” Blake asked hopefully. “You really should have designed an automatic purge system into the ship!” Haldo said conversationally towards the Doctor. “Do your job for you, you mean?” Haldo grinned widely, his lips drawing back almost aggressively over his blunt teeth. “I designed that system!” Jones smirked at the Engineer. “Problems?” Katherine asked, sensing the tension as Blake stepped in from the bridge. “I’ve never had to.” He smiled back. “What do you mean?” He frowned, suspecting that she was about to say something utterly profound that while annoying him deeply would be virtually impossible to refute. “This is a Starfleet ship!” Blake replied stubbornly. “And you?” He grumbled weakly. “On speakers…” Blake frowned angrily, irritated that his tactical advantage had vanished. “Hello!” A voice cheerfully called out around the bridge speakers. “This is Captain Blake Girling…” He began haltingly. “Then you have us at a disadvantage!” Haldo grumbled. “Who are you?” Blake insisted. “Then it won’t matter then if you explain, will it?” Clogg growled as the console he was staffing reviewed the shields of the vessel. “You had something to do with this?” Blake scowled. “After this admission, you do realise I will have to arrest you?” Blake dug his fists into his sides angrily. “That would be a neat trick!” The voice began to laugh openly at the suggestion. “I will send a boarding party to arrest you!” Blake told them flatly. “We’re going to arrest you.” Clogg huffed indignantly. Blake turned to his officers with a puzzled expression. “So what do we do?” Clogg waited for instructions. “There it is.” Captain Reader gazed in awe of the tiny platform before them. Two metres wide and plated haphazardly with bare metal panels. Sections varied in colour after being replaced over many years and there were occasional gaps where panels were entirely missing. “This is the only way?” Androv shook his head. “Is everyone ready?” The Captain took a deep breath and marshalled his thoughts at the daunting task before him. “Yes sir.” The young Ensign nodded and swallowed hard fearfully as her eyes took in the narrow platform and long drop to the deck beneath them. “Varpo?” The Captain turned to their alien guide. Reader breathed out heavily and prepared himself for the long dash over the unprotected gantry. “Let’s go.” He muttered. He stepped out onto the plating, feeling the panels shift slightly beneath his foot. His heart pounding in his chest a certain grisly death beneath him he lunged forward and began to run. “Everything is stable!” Blake raised an eyebrow thoughtfully. “Heavily armed ships.” Blake corrected with a smile. “You have an odd idea of stable.” She smiled back. “If serving aboard the Corinthian has taught me anything it’s that things can always get worse.” She told him without a shred of sarcasm. “Shall we get on with this report?” Blake picked up the Padd dejectedly. Three people materialised on the bridge of the Corinthian in a shimmering translucent light. At the head was a tall man with a shaved head and piercing eyes. Behind him were two shorter Humans, both with dark hair and all were casually dressed in dark clothing. “It’s bigger than it looks from the outside!” The tall Human noted nonchalantly as he glanced around the bridge seeming more disappointed than impressed. “And you are?” Blake asked, his expression stern. “Captain Girling!” Blake sneered angrily. “I have to ask what you did to the crew of the Allek vessel.” Blake ignored his outstretched hand. “Perhaps we should call you that at your trial?” Clogg suggested dryly. “Except your confession.” Blake reminded them. “Under Federation law a citizen can’t condemn himself without being made aware of the legal consequences.” Quill smiled knowingly. “We obviously all have a lot of questions.” Blake raised his eyebrow curiously. “I told you they’d try to do that.” Cole laughed at their efforts. “I can lock a tractor beam onto their targeting scanners to prevent beaming.” Haldo suggested. “And I thought the other thing…” The last of the three men said proudly. “These are serious charges.” Blake persisted. “You’re not in the position to make demands…” Blake frowned curiously, wondering what was coming next. “Oh you’ll want to do this.” Cole told him from the engineering console. “Do you actually know any of what is going on here?” Quill asked. “Perhaps you could enlighten us?” Blake suggested with a note of distinct annoyance. The muscles in his legs burnt angrily as he sprinted across the metal gantry. His heart pounded weakly in his chest, fuelled solely by adrenaline and a force of pure will, his strength long since exhausted. He pushed all thoughts of the long drop beneath him to the rear of his mind as his feet clattered down heavily onto the precarious panelling. The towering bridge swayed slightly with the rhythm of his steps above the horrors beneath, the aliens and their vats of sickly yellow liquid, separated from him by a fall his body could not easily survive if his footing were to falter. Captain Reader glared ahead, fixated on his task. He could see the dark alcove at the other side, a small room where the bridge headed, bathed now in dusty silence and grim shadows from many years with no use, a forgotten place which lead to their ends. He allowed himself a smile as the goal loomed large before him and his dash drew close to an end. Suddenly he was falling, he heard the sound of a panel shearing away from the platform where his leg had torn through and was falling. His hands clawed for purchase in panic as his weight carried his body through the hole. His fingers grasped onto a torn and twisted piece of thin metallic fabric and he clung on in terror. His mind noticed first the odd sensation of the material, not at all cold to the touch and oddly soft for a metal. Then slowly his mind registered the dampness of his blood, the pain of his torn skin as the splintered plate cut into his tense fingers. He glanced down below. His feet swung uselessly beneath him over one of the vats. Inside the gigantic rusting cylinder the sickly yellow liquid churned and bubbled as if in expectation of his body, ready to devour his soul through his decomposing flesh as it would rot his body away from around him sealing his mind into a hopeless prison of agony with no release of death. What little they knew, what little observation and reason he and the Starfleet crew of scientists had ascertained came suddenly to nothing in his terrified mind. There was no bio-organic resin life-form beneath him, just the yawning chasm that led straight to hell, licking softly at his ankles and waiting for his inevitable plunge through the very gates of damnation. He clung on with every ounce of will and strength he had ever had but it was not enough. The torn panel bit at his skin like the teeth of a hungry animal, ripped into his flesh and he slipped ever closer to the horrors beneath. “We’ve got you!” A voice cut into his thoughts and reality seeped back into his mind through his clouded fantasies of doom. He glanced up, his chest heaving in panic and his heart pounding so he could hear his pulse raging through his ears. The engineer and Varpo, his alien guide were dragging him up, their hands on each of his arms. He felt light, as if his body had fallen to its doom as he lay on the bridge, his rescuers laying exhausted beside him. “We need to go.” Captain Reader gasped as he drew himself up, flexing his hands weakly and ignoring the pain. His legs were wobbly and weak beneath him but somehow he managed to command them to carry him forwards. “Yes, sir!” The young Ensign agreed wearily. “What does the real one say?” Blake shrugged. “Shall we continue?” She asked with a slightly annoyed expression. Captain Girling ignored his comments as he sat at the head of the table. Beside him sat his chief engineer, Haldo and Doctor Jones. The three visitors sat opposite. “You do!” Cole gestured at Doctor Jones who sat listening incredulously. “I do?” He pointed to himself as he glanced around, generally mystified. “Section 31?” Doctor Jones puzzlement deepened. “And there’s a Section 31 ship out here I want you to capture and hand over to the authorities.” Quill continued. “And what is your way?” Haldo squinted as he turned to the man. “What exactly is going on here?” Blake raised a hand to his chief engineer for him to remain quiet. “Are you going to capture the Section 31 ship or are we?” Quill asked in reply. “You have to tell me why I should trust you!” Blake told him flatly. “What do you mean?” Haldo sneered. Quill glanced to Cole, something communicated between the pair in silence. Cole nodded and shrugged before turning back to the Captain. “Have you ever heard of the Eugenics war?” Quill asked, knotting his fingers before him as he spoke. “World War three?” Haldo nodded. “I hope you’re a better engineer than a historian.” Cole told him with a smirk. “What?” Haldo barked in annoyance. “Try to take this seriously, Thunderstick.” Cole scolded his exuberant friend. “Admiral Loxley has everything to do with Khan!” Quill leant forward, ignoring his comrade. “I’m really lost.” Haldo hung his head and sighed. “It’s simple really.” Blake told him. “How did you…?” Haldo stammered. “Calm down.” Cole said softly to his friend. Quill hung his head and breathed heavily a couple of times. “How can you have been there?” Haldo asked, his voice low and respectful as often it was not. “Section 31?” Cole shrugged with a wry smile. “Some things never change.” Haldo nodded grimly. “The Bildersberg group.” Cole replied. “MJ12, The New World Order, The Masons, The Illuminati. These people attracted new names like my friend attracts sexually transmitted diseases.” He patted their crewman and he chuckled to himself quietly. “You’re saying you were alive during the Eugenics war?” Blake folded his arms across his chest. “Long enough to have learnt how to stop a mans brain working?” Blake surmised. “We can’t tell Starfleet that.” Katherine shook her head and smiled dolefully. Katherine flung the Padd onto the desk. It clattered over to the Captain and laid before him with a button marked “Erase” flashing in the centre of the screen. “If they’re telling the truth then maybe we will.” She suggested with a grin. “Haven’t you cracked that code yet?” Haldo grinned maniacally at the Doctor. “I admire you tenacity if not your intelligence.” Haldo smirked disparagingly. “A three digit number?” Security Chief Clogg called out from the rear of the ship. “Well if the next number is also a three digit number then perhaps they’re co-ordinates?” He suggested. “We made it.” The Engineer gasped, glancing back at the platform behind them. “Barely!” Varpo added with a glance at Captain Reader. “What was that thing used for?” Ensign Coles asked rhetorically as she glowered accusingly at the narrow platform with no safety rails. “You never mentioned them!” Captain Reader started suddenly. “You’re not still going on about that, are you?” Doctor Jones shook his head and frowned. “You built it and you never figured out how it worked.” Haldo reminded him dryly. “Who is the greater fool, the fool or the fool who follows him?” Clogg asked the pair. “I think you insulted me!” Haldo frowned as he turned to the rear. “It’s really very simple.” Cole told the engineer. “It would have to be.” Blake sighed at his officer. “A Vulcan?” Doctor Jones shrugged. “You really wouldn’t believe me if I told you.” Quill frowned haphazardly. “Worse?” Doctor Jones looked troubled. “This is how we made the money to buy a faster than warp drive!” Quill told them with a mysterious grin. “You deal in weapons or something?” Blake crossed his arms disapprovingly. “When he says buy the drive, he actually means that he conned them out of it!” Cole corrected the slightly inaccurate statement. “I paid them!” Quill frowned defensively. “There aren’t many interstellar species out there that are naive enough to trade technology for magic beans.” Cole shook his head. “You sell technology in the middle of a war zone?” Blake shook his head. “Of course not!” Cole shook his head and laughed at the very notion. “I don’t!” He assured them with a look of consternation. “You shouldn’t make the mistake of crediting him with too much intelligence.” Haldo quipped. “It’s a race.” Cole smiled. “A race?” Blake turned to the scientist. “We won last time and were the favourite this to win again.” Cole added with a wry grin. “I see.” Blake shook his head, knowing that he should disapprove but finding that he really was beginning to find the whole thing more tolerable than he would have readily admitted. “I would imagine so.” Blake told them with a nod. “Goodbye, Captain Girling.” Cole said as he stepped back ready to beam back aboard their own ship. “You know a lot about us.” Blake nodded. “Nah…” Quill shook his head as the three of them dematerialised. “Have you detected the lead vessel?” Blake asked quietly, his mind racing ahead. “I believe so.” Haldo nodded. “It certainly doesn’t look like one.” Haldo shrugged. 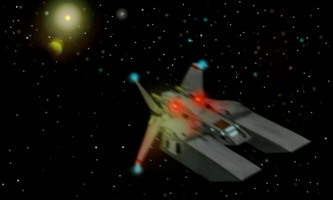 The Doranian cruiser loomed large in the Corinthian's holographic viewer. Blake Girling stepped onto his bridge from his ready room, still mulling the finer points of his report with Ensign Rogers. “Four minutes to contact, Sir.” Clogg reported. “Any cloaked vessels in the vicinity?” Blake asked, still distracted by thoughts of the recent events. “Any more Allek ships?” Blake frowned. “Any Starfleet type vessels?” Blake grinned back. “And there it is.” Varpo gestured to the final leg of their long journey. “Home.” Crewman Gradlow said mockingly as the small team stood before their cell door. “Yes Sir.” She smiled back warmly. “Not if they catch us.” Varpo reminded them as he glanced around the corridor. “Will you be able to get back to your cell?” Ensign Collins asked. “I’ll bet you do.” The engineer grinned knowingly as he slapped the little alien on the back. “I heard something.” Ensign Collins glanced round fearfully, plunging the group into silence. “What did you hear?” Reader whispered nervously. “No…” She closed her eyes pathetically, helpless to save them. The electronic locks to the door were still active and behind it lay their salvation. “If they find us…” Reader spoke rhetorically as he racked his brain for a solution. “They won’t!” Varpo told them with a tone of absolute certainty as he walked away briskly from the group. “No…” Ensign Collins cried out as he stepped away from them. “We’ll find another way.” Reader stepped forward to the little alien whose knowledge of the alien vessel had made their plan possible. “No.” The Ensign wiped a tear from her face as her eyes burnt uncontrollably with furious emotion. “I owe my life to avenging the death of my wife.” Varpo said, his voice low, his words more to muster his courage than to inform anyone else of his intentions. “My life is now yours, so is her revenge.” His pace suddenly quickened and he was gone, swallowed by the shadows that lurked behind the brilliant light of the panels outside their cells. “I presume that disqualification is not something they take too lightly?” Captain Girling smirked knowingly as the beam coursed from his vessel. 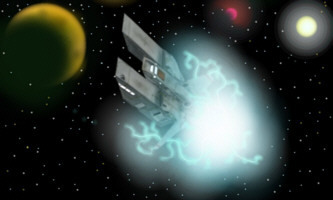 “Perfect.” Blake nodded to himself as the phaser beam tore into the invisible vessel, overloading it’s primary systems. The upgraded runabout lit up suddenly, blue arcs of energy surging from its cloaking device and bristling from the weapons array. “Nor are we.” Clogg reminded them. “Good job we’re on their side.” Blake noted as he turned to the viewer. “As far as we know.” Clogg grumbled. “Blake!” The Doctor jumped up suddenly. “Was it aimed at us?” Haldo dropped his head to his upturned hand as if fed up with him already. “What did it say?” Blake asked calmly. “Co-ordinates of what?” Blake shrugged patiently. “It was the last number that made all the pieces fall together.” Jones took a deep breath and tried to calm himself. “What was it?” Blake asked, his hands knotted behind his back. “There’s only one thing it can be and that means I know who it’s from.” He waved his arms about in excitement as his enthusiasm again gripped him. “Why would someone give us their shield frequencies?” Haldo sneered at the very suggestion. “The distortions are due to a high warp factor and massive deflector beam coming directly in the direction of the co-ordinates.” Jones grinned back. “Captain Reader.” Blake smiled uncontrollably. “We have a big advantage.” Clogg nodded, highly impressed that something he could really appreciate had happened. 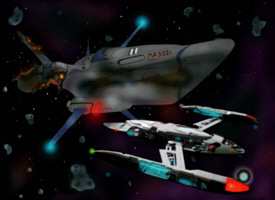 “It’s been quite a day.” Blake turned to the viewer to where the little Runabout was being viscously harassed by several race officials who had weapons that appeared twice the size of their ships and them many times larger that their quarry. “I have just one question.” Haldo sighed. “What’s that?” Blake said softly as he gazed at the spectacle before him with a new sense of optimism.